To many of us — especially those in love with vintage fragrance — Jana has the dream job. She owns The Fragrance Vault in gorgeous Lake Tahoe. 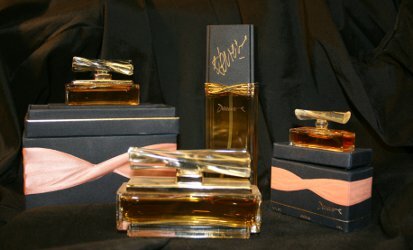 Besides selling what’s on the market today, she carries rare, discontinued and vintage fragrance, and estimates she has more than 8,000 bottles in stock. Marshmallow, her half-malamute rescue, greets visitors. Anytime she wants, she can sample from decades of Caron Bellodgia or sniff Shiseido Nombre Noir. Jana says it took her a long time to discover perfume. She grew up poor, splitting her time between her mother’s home in Rhode Island and her father’s place on a Native American reservation. In her teens, she moved in with her Italian grandmother, who was “hard-working, formal and quite glamorous” and who had bottles of Chanel Coco and Diane Von Furstenberg Tatiana, among other fragrances, on her dresser. Jana started wearing her nana’s 1950s wardrobe to high school and developed a fascination with “the beauty thing.” She wore Yves Saint Laurent Kouros in college, where she studied Russian culture and Soviet affairs, and had bottles of some of the popular fragrances of the time, including Yves Saint Laurent Paris, Cacharel Anaïs Anaïs, Anne Klein, and Dali Laguna, but she wasn’t yet a perfume nerd. She discovered she was an “aldehyde ho” and loves rose, wood, and earthy scents. Jana points out that, like art, it’s possible to admire a fragrance without wanting to wear it, and that’s how she feels about tuberose- and jasmine-heavy perfumes. Lately, she’s been loving heliotrope. She says she tends to like Dior “Dolce Vita” style fragrances, and she used to wear Patou 1000 a lot. Just a few of her long list of favorites these days — and I really am listing only a fraction of the names she sent! 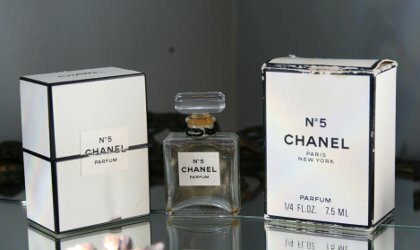 — include vintage Yves Saint Laurent Y, Rive Gauche and Nu, most vintage Caron (in particular Infini, Nocturnes and French CanCan), Deneuve, vintage Louis Feraud/Avon collaborations, Imaginary Authors L'Orchidee Terrible, Chanel No. 22, Piguet Bandit (1950s/60s only), Moments by Priscilla Presley, Xerjoff Irisss and Lua, Prince Matchabelli Aviance, vintage Le Galion Snob, and Dior Diorella and Eau Sauvage (“old oily 70s versions”). About 12 years ago, Jana struck up a friendship with the owners of The Fragrance Outlet, a perfume boutique with a lot of old stock they were selling inexpensively to people who quickly resold it for a fat profit. Jana clued them in to the value of their collection and helped them inventory it. In 2012 when they retired, she bought their business and renamed it The Fragrance Vault. She’s changed the store a lot, not only by moving it physically, but by adding to the shop’s backstock of discontinued fragrances. So, what does a woman who has access to a deep lineup of fragrances keep on her shelves at home? A relatively small collection, it turns out. 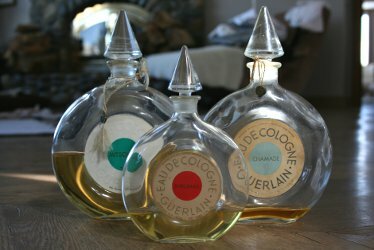 Aviance, Yves Saint Laurent Y, and a rainbow of 1980s Caron fake leather bottles form the heart of her at-home perfume. 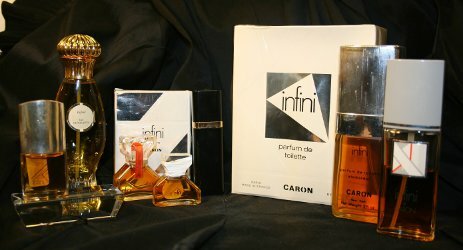 From the Caron collection, she especially loves Infini (“It took me 15 years of trying it off and on to wrap my head around it and grow to love it”), Narcisse Blanc and Nocturnes. Jana says she stores her perfume in her bathroom, but quickly adds that her house is built into a cliff, and her bathroom doesn’t get warmer than 60 degrees. She’s a stickler for preserving old perfume and sprays Private Reserve wine preserver into splash bottles to displace the oxygen that might spoil a fragrance. Jana and I wrapped up our conversation when she needed to finish unpacking a box of vintage fragrance she’d bought and head home to take care of the rescue wolves she fosters. You have to wonder how the wolves like Jana’s perfume. My guess is they go big for Bal à Versailles. wow! wow! wow! I am speechless…. Nocturnes de Caron is rarely spoken of and is the closest to a signature fragrance for me…and Aviance, yes, I wore that one as well! And Tatiana was also part of my fragrance wardrobe. Angela, I just love these posts!!!! I’m following you into the Fragrance Vault!! Love to read about others’ collections! I love learning about them, too! These interviews are really fun for me to do. Exactly what I’m going to do too. “We’re going to have an Aviance night”???? I know! I’ll never forget that song. That and the Oscar Meyer weiner jingle. What a combination! I can smell hot dog grease right now . . .
And I see the big weiner mobile! That song is earworming it’s way through my head now! They just don’t write jingles like they used to…. I’m so glad you enjoyed the post! I only wish I’d had enough space to write out all the stories Jana told me, including slipping a bottle of No. 5 parfum into her grandmother’s casket. Oh, I love this No 5 story! Isn’t it great? I heard it after I wrote the post, or I would have included it. What a great story! I too went through a few bottles of Aviance and Tatiana back in the day. Thank you for the memories! I have a mini of Tatiana in my stash somewhere, I’m going to unearth it and try it later this week. I haven’t tried Tatiana in ages, but I remember having a bottle in college and loving it! What a fascinating personal history! Perfume nuttery and the vintage perfume re-sale business certainly attract some of the most interesting people; I’m impressed by the story of how Jana acquired The Fragrance Vault. Also… wolves! I’m dying to visit both the boutique and the wolves! Jana’s story is so uplifting. I had a hard day at work today and your story was the perfect anecdote. Thanks for the peek Angela! Now to go check out the vault. I’m sorry about your day, but happy to provide a few minutes of entertainment! Jana has her own Perfume Playground (I want to shorten it to PP but it didn’t sound good at all). Anyway, it seems she has more perfume in the vault than the Perfume Museum in Barcelona. Thanks for a glimpse into another person’s collection! That’s hilarious about PP! Wise choice you made to stick to the full words. How awesome!! So nice to hear these fragrance wardrobe stories. They’re so fun to write! And I’ve met the most amazing people through them. People are fascinating, and I think that goes double for perfume people! Oh, I’m so jealous! I’m hoping to get there at some point, too. You gotta respect a lady who has rescue wolves and a half-malamute! Love your writing, Angela! Just returned from a visit to my friend, The Perfume Bottle Lady. In exchange for the Turin/Sanchez book, she gave me a Vega and a very old, medium size Chant D’Aromes in the teardrop-shaped bottle, plus a lot of minis!!! I’m so lucky. 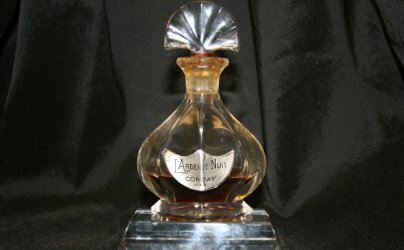 My friend is 81 now and has not hundreds, but thousands of bottles from every line, giant factices, plus art glass, Devilbis, and a collection of glass polar bears. And she’s moving it all to a nearby island to live closer to her daughter, granddaughter, and new great granddaughter. My heart beats faster even hearing those names! How fabulous! Your friend was smart in giving them to you, too, since you’ll appreciate them so much. I hope there’s room in her new place for her collection. 2 Thumbs UP!! I love this article. Tatiana was my 1st perfume – that and her lovely story, and the rescue wolves, what a lovely trip you took us on!! Her shop is an absolute dream come true! It sounds really terrific to me, too! Oh Jana! If only we lived closer together! I think we’d get along smashingly! I live for vintage. I go to at least two antique malls a week, scoping out new finds. Recently I found a mostly full bottle of Poison, an almost empty bottle of Bellodgia parfum, and a ~30ml No. 5 EdC spray, all in an hour. I love your Guerlain clock splash collection. I found a sealed Shalimar one recently. Chamade would be my top pick for next, but everything other than Shalimar is so rare in Texas. I also love Y, too. What a gem! It sounds like you found your scent twin! Perhaps! At least someone to have a big ol’ gabfest! One day I hope to have my collecting organized enough to share with you all. I’m just rubbish at organizing though. Mine started on a small standing shelf in my closet but as my collection grew…. It’s almost like an infestation! A happy one, I hope! Definitely! I have more on the way as we speak. I’ll reach out when I finally get organized. By vibe is definitely the best way to organize scents, if you ask me! Strangely, it does work for me. I have “comfort,” “oddball,” etc. Wonderful article, so interesting, and also very beautifully illustrated! The photos are drool-worthy for sure! I want to break into one of those bottles of Deneuve right away. I had been wondering if I should look into that wine preserving gas. It sounds like I really should. I am green with envy, but it sounds like Jana has earned it and is also using the collection to do good. More power to her! From my conversation, I’d say she definitely deserves it and is making the most of it. Plus, yes, wolves! Ali Baba’s cave, more like… wow!! O M G. I spend many summer days near Truckee, which is just inland from the lake . . . this is now on my must-visit list. Thank you for tipping us to The Fragrance Vault, Angela! You must visit it, then! I’m super curious to visit it, myself.